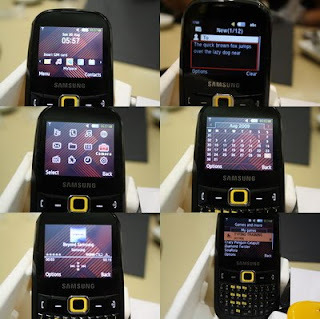 After reviewing the Samsung Genio Touch, here comes another Genio mobile phone from Samsung: the Samsung Genio QWERTY. The Samsung Genio QWERTY retained the colorful back cover of its sibling, the Genio Touch but has foregone the touchscreen for a Blackberry-like QWERTY keypad. Well, let's check out the Samsung Genio QWERTY. 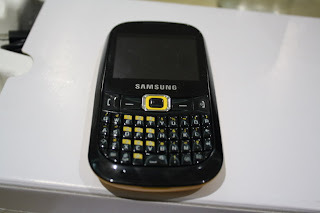 The Samsung Genio QWERTY is somewhat similar to the Samsung B7330 OmniaPro I've previously reviewed. Supposedly, the Samsung Genio QWERTY will have interchangeable back panels. 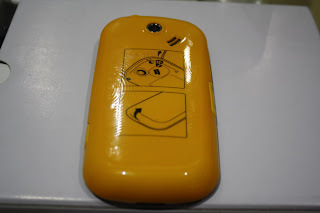 That's cool except that Samsung made the colors of the QWERTY keyboard and the directional keypad match the back cover so I don't know what this mobile phone would look like having a pink back panel and a yellow keyboard. The keyboard is a bit cramped so those with big fingers would take a while to get used to the Samsung B3210. The screen is bit small for me and I don't know if I have just gotten used to AMOLED screens but the colors of the Genio QWERTY screen is a bit washed out for me. On the right is the dedicated camera button, on the left, the volume rocker, and on top, something which I'm not used to seeing on mobile phones below 100 quid, is a 3.5mm headset jack, beside it is the microUSB port. I had a hard time taking out and putting back the back cover. I'm used to sliding the back cover but it seems that on the Samsung B3210, you have to pop open the back panel. Putting back the back panel is a bit of a hassle and there are times when the back panel's not completely put in place. Anyhow, the design of the Samsung Genio QWERTY is pretty much solid. The materials used doesn't look cheap and the back panel's sturdy. The Samsung Genio QWERTY's homescreen gives you some sort of sliding widgets. There are shortcuts arrange horizontally at the bottom of the screen and you can browse through it using the directional keypad. There's a Myspace and Facebook shortcut on the homescreen sliding widget too. The menu screen reminds me of the Samsung Lucido's interface. Menu's are limited to just one screen. There's a calendar app, messaging, phonebook, settings, settings, clock, music player, file explorer, fm radio, and a web browser. Messaging is the same as with Samsung's non-touchscreen mobile phones. I have pretty much big fingers so it wasn't easy getting used to the keyboard of the Samsung Genio QWERTY but after a while, you get the hang of it. The music player is not that pretty but it plays MP3s, AAC, and WMA music file formats. The music player can show your album art and can also run on the background, replacing your homescren sliding widgets with just the music player. Audio quality is okay, audio through speakers is so-so but the 3.5mm onboard headset jack is definitely a plus for the Samsung Genio QWERTY. I was expecting to see trial versions of games again on the Samsung B3210 but thankfully, the ones on my unit are full versions. I like the typing test game and this game would be really useful for those who are first time QWERTY users. I actually didn't bother with the web browser. With no 3G and WiFi and only the Access Netfront browser, I wish you luck trying to browse web pages. However, if you do download the fabulous Opera Mini browser, even EDGE would do thanks to Opera Mini's server side processing, web pages actually render a bit faster. The Samsung B3210 Genio QWERTY only has a 2 megapixel camera but like the Samsung Genio Touch, it actually produces decent images even without autofocus. Here are some sample shots below. Blackberry's are still a hit to teeners but come on, like the iPhone, not many tweeners could afford one. The Samsung Genio QWERTY offers a cheap alternative. The colorful back covers, decent camera and audio quality would make the Samsung B3210 Genio QWERTY worth your 100 quid. nice review about Samsung B3210 Genio qwerty. Whatever samsung products may look, of whatever features they may have but purchase one if you have no expectation of post service. Does this have windows live messenger built into it ? No it doesn't have the windows live messenger but you can download palringo, a universal instant messenger and you can access your YM, Gmail, Windows, even Facebook chat acocunt. I want this phone but, does it have a touchscreen then or not? I really like this phone, I have already asked to have it for Christmas, is there really a typing test game? i really like them. Good Review. how do you download apps onto it? just got this phone today and it truly is amazing value for money. i just got this phone its great but im having a problem trying to put my pics on to my laptop anyone help ? Try going to settings, connections and setting the usb connection to mass storage device. Your phone will be read as a USB flash disk and you can transfer your pictures. 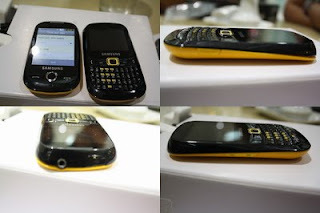 hi just wondering which one is better, the Genio Touch or Genio qwerty? Im Going To Get This Phone On Christmas Hopefully Sounds Like A Great Phone. How does the Samsung B3210 show an attachment to an email? Can any cheap qwerty mobile show email attachments? @anonymous, If you're message-centric, go for the Genio QWERTY, otherwise, the Genio Touch, I think is the better choice if you don't mind not having a QWERTY keypad. @tony79amboy, hmm, what kind of attachment? Unfortunately, I don't think the Genio QWERTY can show attachments, though I could be wrong, I didn't try opening an attachment when I reviewed the phone. i love samsungs i think theyre so good with looks and features and if you go on ebay their are quite a few decent genios (only touch) for about £70 max. where can u get some covers from! I really like this phone. Great Review. Is the Internet free? Thanks. @ Briony Sharp: If you're on PAYG, you'll have to pay to use the internet. If you got it on pay monthly, it would depend on your contract, if you have unlimited data plan, you don't have to pay. @ Sarah: No, an M2 card won't fit as M2 card are Sony's proprietary memory cards and would only fit certain sony ericsson phones. The Genio QWERTY will only accept MicroSD cards. My Genio Qwerty did not come with a USB cable in the box, does anyone know which type of USB cable is compatible with the Genio Qwerty? I can't seem to download Parlingo to my phone or to my mac, is there something I'm not doing here? I need an instant messenger to my Samsung Genio Qwerty, but can't seem to find a good link on both stations.... Any help please!? if u r on orange Pay as u go and on the dolphin package, u can download the link for IM to ur fne via there website. i cant transfer pics onto this phone the phone doesnet reconise the pics wen i try to view the pics on memmory card it shows a big white question mark ???? @ANGEL, what's your email provider? From what I remember, setting up emails on the B3210 is pretty easy if your email provider is on yahoo, gmail, hotmail. You just input your username and password. @Anonymous. What's the picture format that you're transferring? I think the B3210 only recognizes jpeg files. Any other format and the B3210 won't recognize it. I have this phone. It has frozen. I can take my battery out and then it lets me turn it on via the on/off button but once it gets to the homescreen it just freezes. Do you know what's wrong with it? Hi, I need some help and I'd be very grateful if someone would. I got the Samsung B3210 and it hasn't come with a usb cable, could I still upload photos ect. with out it? Please tell me soon with the correct procedure. You can send the picture to your email as an attachment or send it via bluetooth. Using the bluetooth, you need to have bluetooth on your PC and pair it with your mobile phone. I have had this phone for 2 or 3 weeks now and I love it. Although it has small keys I soon got use to it. It's easy to use, and like other Samsung phones has a "widget" screen. The screen isn't the biggest but is visable and easy to read. The camera isn't top of the range but it does me fine. I hardly use the camera but the times I have it's took a really good photo even in the sun! I mainly use my phone for texts, calls and internet including emails and they've all been great! I use to have the Samsung Tocco Lite, and I must say I'm glad i changed. I would rate this phone 4/5 just because of the small qwerty keys. @emily. sorry wasn't able to reply sooner. I'm on vacation and haven't been checking in on my blog. If you have small fingers, the B3210 will be easy to use. I have had a samsung genio qwerty. When web browsing I have somehow got the font size bigger as though I have zoomed in. I do not know how to get it back to the normal size. I have tried turning the phone on & off. Thanks. i really want to get this phone and read lots of reviews bout it...people have said that the keys are too samll for big fingers...is it true????? @angelacopestick. Try changing the font in the settings. I forgot where in settings you could find the font but try playing around with it. @anonymous. yes, the keypad would be a bit uncomfortable for those with big fingers. does it cost to go on msn and facebook? can you download new themes for the phone? i have i and i know it may sound picky. but im not too fussed on the themes. i have looked but all i can find is bloody football ones. PLEASE HELP! uboodDoes this phone have bluetooth?. hunter 11 i got the b3210 from carphone warehouse 50 quid. can you connect to facebook on this phone? anywhere? When viewing the browser, hit Z zoom out and B to zoom in. Thanks annonymous regarding the zoom, had me confused as to how to fix and ive worked with mobiles for last 8 yrs !!! Heyy , i'm thinking of getting this phone , just not sure if its worth it , does it have free facebook ? My b3210 is not properly functioning the images & wallpapers appears question marks? why is this so? and all the settings was reset? after I off the phone and the next time i open it it was all changen the images, themes and music, have been corrupted i think so.. pls do help me to this one!